Just visit this page to rest Real Costs, and choose different units. Metric or USA. Your choice. Here. 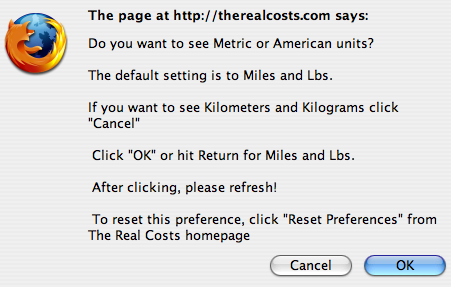 Experience the project by installing the Real Costs plug-in into your Firefox application. Currently, this plug-in pulls each flight origination and destination information from the page, calculates the CO2 produced, and reinserts that information next to the flight. It also inserts a graphical comparison of the CO2 produced for that flight in comparison to making that trip by bus or train, and to other metrics such as the average CO2 produced per capita for the average US citizen and the average world citizen. I am currently configuring it to work on the websites of the largest air carriers. A list of these carriers and documentation of all scientific calculations is available on the project Wiki. The objective of the “Real Costs” project is to increase awareness of the environmental impact of certain day to day choices in the life of the Internet user by fusing art, science and technology in an ecological intervention. By presenting this environmental impact information in the place where decisions are being made, it creates a real impact on the viewer, encourages a sense of individual agency, and provides a set of alternatives and immediate actions. In the process the user/viewer will be transformed from passive consumer to engaged citizen.